Text: Origins. This Latin resurrection text of unknown authorship can be traced to three important manuscripts from the 14th century. All three were compiled into a critical edition by F.J. Mone, in his Lateinische Hymnen des Mittelalters, vol. 1 (1853), no. 143, p. 195 (Fig. 1). 1. A manuscript from Kloster Engelberg in Switzerland (I. 4/25), dated to 1372, contains the longest text, which corresponds to stanzas 1-3, 5-7, 9, and 11, shown in Fig. 1. 2. A 14th century manuscript at the Bayerische Staatsbibliothek in Munich (Clm. 5539, f. 142) has the same text as in Engelberg, but only stanzas 1-3, 5, 7, and 9. This source is described as bearing a melody. 3. A 14th century manuscript at the Národní Muzeum, Prague (V H 11), corresponds to 1-3, 5-7, and 11, but contains textual variants. Other Prague manuscripts from 1410 and 1420 contain two additional stanzas not found at Munich and Engelberg. Stanzas 4, 8, and 10 in Mone’s compilation can be dated to the 16th century, and thus are considered later additions. For more data on manuscript history, see the bibliography below, especially Mearns (Julian), Mone, Bäumker, Daniel, Dreves, and Wackernagel. Fig. 1. F.J. Mone, Lateinische Hymnen des Mittelalters, vol. 1 (1853), pp. 195-196. Text: Translations 1 & 2. Two capable translations are provided here for comparison, neither of which have entered into common use but reflect the Mone edition well. The first is by Abraham Coles (1813-1891), “For human solace, Christ today,” from The Light of the World (1885 | Fig. 2), which has ten stanzas, omitting stanza 11 of Mone (Fig. 1). The other is by J.M. Neale (1818-1866), “Today the victor o’er his foes,” from Mediaeval Hymns and Sequences (1851 | Fig. 3), in ten stanzas, omitting stanza 10 of the Latin. Neale and Coles both retained the simple meter and rhyme of the original (iambic tetrameter). Fig. 2. Abraham Coles, The Light of the World (1885). Fig. 3. J.M. Neale, Mediaeval Hymns & Sequences (1851), pp. 114-115. Fig. 4. Lyra Davidica (London: J. Walsh, 1708), pp. 11-13. Images courtesy of the British Library. 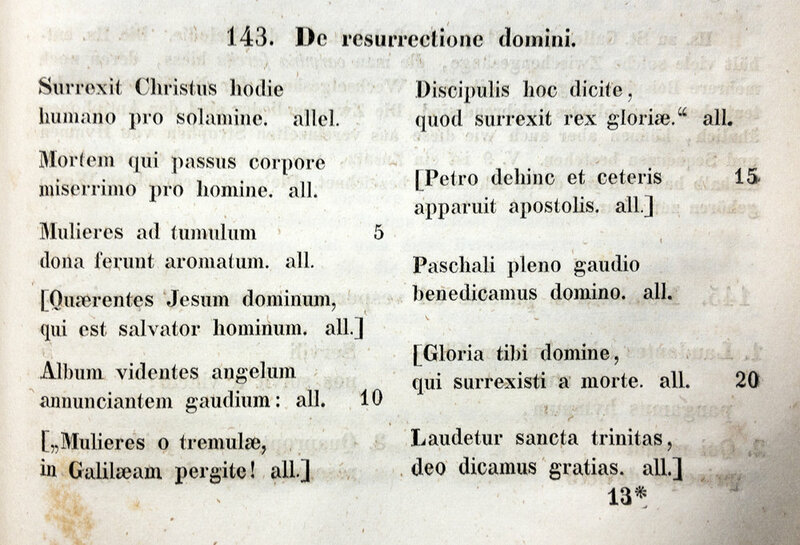 “Jesus Christ is risen today” was printed with alterations in John Arnold’s The Compleat Psalmodist, 2nd ed. (1750 | Fig. 5). The first stanza from 1708 was retained, while the others were replaced without regard for the Latin. The tune is more ornamented, and two additional harmony parts were added. Fig. 5. John Arnold, The Compleat Psalmodist, 2nd ed. (1750). Fig. 6. Charles Wesley, Gloria Patri (1746). Commentaries often mention a variant of “Jesus Christ is risen today” printed in an edition of Tate and Brady’s New Version of the Psalms of David, ca. 1816, but this is merely a reprinting of Arnold’s version (for example, see John Julian’s Dictionary of Hymnology, p. 597, for Arnold and NV side-by-side). The only significance would be in the proliferation of Arnold’s text among followers of the New Version. Some hymnals have appended a trinitarian doxology to Arnold’s version, especially the one by Charles Wesley (1707-1788), “Sing we to our God above.” Wesley's doxology was the second of seven hymns for the Trinity in Hymns and Sacred Poems (1740, p. 100); this was repeated in Gloria Patri, or Hymns to the Trinity (1746 | Fig. 6). German translations, including “Erstanden ist der Heilige Christ,” can be traced to the 15th century, including a 1478 manuscript in Breslau, and some circulated in printed hymnals by the 16th century. See especially the argument in The Hymnal 1982 Companion (New York, 1990) for a connection between Lyra Davidica and “Erstanden ist der heilig Christ,” as edited by Johann Leisentrit in Geistliche Lieder und Psalmen (Bautzen, 1567, pt. I, 132v-133r). Text and Tune: Adaptation. Charles Wesley’s “Christ the Lord is ris’n today” is essentially a completely new hymn on the resurrection. Nonetheless, its role as an alternative to the Lyra Davidica text is clearly shown by its associated tune. Wesley’s text was first printed in Hymns and Sacred Poems (1739 | Fig. 7), where it was part of a cycle of hymns for the church year, beginning with Christmas (“Hark how all the welkin rings”), then Epiphany (“Sons of men, behold from far”), Resurrection (“Christ the Lord is ris’n today”), Ascension (“Hail the day that sees Him rise”), and Whitsunday/Pentecost (“Granted is the Saviour’s prayer”). Fig. 7. Hymns and Sacred Poems (1739). “Christ the Lord is ris’n today” was paired with EASTER HYMN in A Collection of tunes, set to music, as they are commonly sung at the Foundery (1742 | Fig. 8), where the tune was named SALISBURY. The Wesleyan printing of SALISBURY in the Foundery collection (Fig. 8) is similar to the version in Arnold’s Compleat Psalmodist (Fig. 5) in the way the tune ends more dramatically in the upper octave, whereas the Lyra Davidica version descends at the end. Arnold may have borrowed this idea from the Wesleys. The note “Vol. 1” (Fig. 8) refers to the 1739 edition of Hymns and Sacred Poems; vols. 2 and 3 elsewhere refer to the 1740 and 1742 editions. The Wesleys used the tune again in Select Hymns with Tunes Annext, 1761 (Fig. 9), this time with Charles Wesley’s paraphrase of the Gloria in Excelsis, “Glory be to God on high,” also from 1739. The 1761 version contains some other melodic differences, making it closer to the received version of EASTER HYMN (compare the melodic contour in the last two measures of 1742 and 1761, for example). Fig. 8. A Collection of Tunes ... Sung at the Foundery (1742). Fig. 9. Select Hymns with Tunes Annext (1761). Wilhelm Bäumker, ed. “Surrexit Christus hodie,” Das Katholische deutsche Kirchenlied, vol. 1 (Freiburg im Breisgau: Herder’sche Verlagshandlung, 1886), pp. 516-521 (PDF). H.A. Daniel, ed. “Surrexit Christus hodie,” Thesaurus Hymnologicus, vol. 1 (Lipsiae: J.T. Loeschke, 1855), pp. 341-42 (PDF). G.M. Dreves, Analecta Hymnica, vol. 1 (Leipzig: Fues’s Verlag, 1886), pp. 165-166 (PDF). James Mearns, “Surrexit Christus hodie,” ed. John Julian, A Dictionary of Hymnology (1892 | Google Books), p. 1104. F.J. Mone, ed. “Surrexit Christus hodie,” Lateinische Hymnen des Mittelalters, vol. 1 (Freiburg im Breisgau: Herder’sche Verlagshandlung, 1853), pp. 195-196 (PDF). C.E.P. Wackernagel, “Surrexit Christus hodie,” Das deutsche Kirchenlied, vol. 1 (Hildesheim: Georg Olms, 1864), pp. 175-176 (PDF). George Arthur Crawford, “Jesus Christ is risen today,” ed. John Julian, A Dictionary of Hymnology (1892 | Google Books), pp. 596-597. Frank Colquhoun, “Jesus Christ is risen today,” Hymns that Live (Downers Grove, IL: InterVarsity Press, 1980), pp. 105-110.